Specifically, for every 35 reward points you accumulate, you’ll get a free Regular Wich. You’ll also get a free wich on your birthday, a free drink just for joining, and the potential for other random freebies, special promotions, or even cash giveaways. Make sure your card is registered or create an account when you order online. Any Regular Wich plus any side plus any drink! Q: I joined Vibe Club Rewards online, how can I get a card? A: Visit your closest Which Wich and ask the cashier to activate a rewards card. Q: If I get Vibe Club emails does that mean I am in Vibe Club Rewards? A: Not quite! We just need you to update your account here, and then you will be able to start earning points for all your visits when you provide your mobile number in store. (See above if you’d like a physical card). Q: Are Vibe Club and Vibe Club Rewards the same thing? 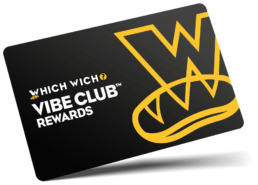 A: Vibe club has now become vibe club rewards, our way of continuing to communicate our new and exciting news to you, but now we can also reward you for your purchases. Vibe Club rewards eliminates the need to print offers, and you can now redeem them in store through your phone number. In order to full transition into vibe club rewards, we just need you to update your account here. Q: If I lose my card can my points transfer to a new card? A: If you have registered your card, then yes! You can continue to earn points by providing your mobile number when you checkout. Just pick up a new card and register it online. Then contact us to combine your accounts. A: You can login to your account here. Forgot your username or password? Get password assistance here. If you still have questions or are cannot access your account contact us. Q: How often is my point balance updated? A: Your points balance is updated instantly once you use your card on a eligible purchase. To view your points balance login to your account here. Your points balance also appears at the bottom of your receipt. Q: Why were 35 points redeemed from my account? A: 35=free wich! You’ve reached 35 points and they were exchanged to load a free wich, that’s all. You can use your reward on your next visit or save it and redeem it on any visit you’d like, it doesn’t expire! Q: How do I earn Vibe Club Rewards points? A: You can either provide your rewards card or mobile number at check out to earn points for your purchase. To learn more about ways to earn points see How To Earn Points. Q: Can I earn points for someone else’s purchases? A: Only one rewards card can be used on eligible menu items. Q: How do I earn a free Wich? A: Once you earn 35 points, a free Regular Wich will be added to your card. You can redeem your reward on your next visit, or save it for another time. Q: Do I earn points when I get my free wich? A: You only receive points on eligible purchases, but any other items on your order will earn you points. Q: I forgot to give or bring my rewards card or my mobile number, how can I add the points from this purchase to my rewards card? A: We can add the points to your account. Contact us with your date of purchase, receipt number, store number (or order number if it’s an online order) and your mobile number/card number. Q: Do I need to have my loyalty card to get points? A: As long as you have registered your card online you can use your mobile number to earn or redeem rewards in store or when you order online. Q: Do I earn points when I order online? A: Of course! Please be sure your card number or mobile number is linked to your online ordering account. Q: How do I redeem my reward? A: First, you need to register your card or sign up with your mobile number to redeem rewards. Every time you reach 35 points, a free Regular Wich will be added to your account. Q: Can I give my Reward to someone else? A: While we can’t transfer a reward to someone’s account, you’re more than welcome to order your free wich for a friend. Q: Do I have to order a Regular Wich for my reward? A: Nope – the value of the Regular Wich can be put toward the purchase of a larger size. Q: If I have two cards can I merge the two accounts? A: Of course, log in to your account here. Next to your card number, select the plus sign and follow the prompts to input your secondary account information. Once the new card has been added, it will show up under the summary of accounts. Select the new card you just added and under manage card select merge card and confirm. You can now use both or either accounts to accrue points for the same account.